At this time of year, snakes are on the move. So here are a few things to look out for if you think you pet has been bitten by a snake. Should your pet show any of these sign or for any reason you feel concerned about your pets health. CONTACT YOUR VETERINARIAN AS SOON AS POSSIBLE! Several factors will determine what sort of reaction your pet has to a snake bite. 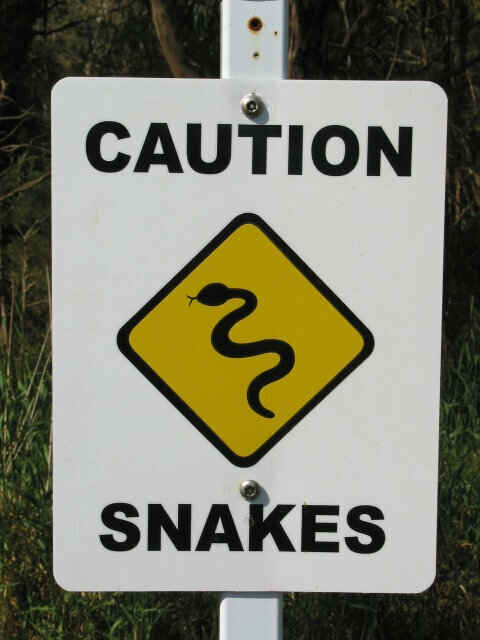 The type of snake (some species of snake are more venomous than others), the amount of venom injected (depends of the size and maturity of the snake) and the site of the snake bite are all contributing factors. Dogs and cats are most often bitten around the head and limbs. Usually the closer the bite is to the heart the quicker the venom will be absorbed into the pet’s system and distributed around the body. At the beginning of summer, when snakes first come, their venom glands tend to be fuller and their bites at this time are much more severe. The length of time since the snake last struck can also be a contributing factor. Sudden weakness followed by collapse. Shaking or twitching of the muscles. Dilated pupils not responsive to light. In the later stages paralysis may occur and your pet may have blood in his or her urine. If you suspect your pet has been bitten by a snake you should immobilise your pet and try to keep him/her as quiet as possible. It is vital that you take your pet to a veterinarian as quickly as possible. The sooner your pet is treated, the better their chances of survival. If possible, try to identify the snake, or get a description of its colour and approximate size, there are several types of antivenom available and it will assist your veterinarian to determine the correct one. Contact Us to make an enquiry or book an appointment today.